Blue ocean slug (Glaucus atlanticus). The "Blue Dragon", as is better known, is a marine shell-less mollusk gasteropod that lives in temperate and tropical open ocean waters all around the world. This pelagic nudibranch belonging to the Family of Glaucidae , is sized up to 3 centimeters and provided with several limb-like outgrowths called "cerata". Usually it shows its vibrant white and blue coloured ventral side floating on the sea surface, thanks to his gas-filled stomach; the dorsal side, which faces the downward, is silvery-gray coloured : this brilliant camouflage provides the slug with protection from predators. 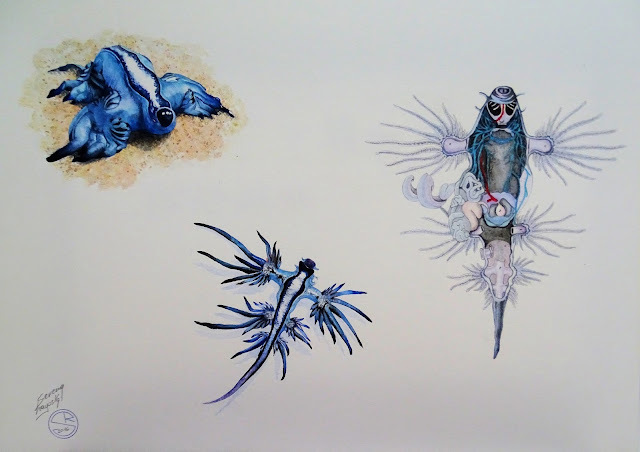 The G.atlanticus is an effective predator on open water dangerous hydrozoans called "the blue fleet": Portuguese-man-o-war (Physalia physalis), by-the-wind-sailor (Velella velella), and blue button (Porpita porpita). The blue dragon, that is immune to them, not only captures the hydrozoans using his chitinous jaws, but also it can incorporates their nematocysts into his special cnidosacs, storing them on the tips of his cerata. In this way it provides hitself a defensive tool for his own protection. The G.atlanticus is a hermaphroditic and oviparous mollusk : it produces strings of eggs in a mucus membrane, which float free or often remain on his dead preys.